Employee Advocacy for Retail: A Strategy to Compete with Amazon? Online initiatives are springing up across retail, as brands try to compete with the worlds leading online retailers. So how do you get ahead? Employee Advocacy. Twenty years ago, Carrefour – or more precisely Promodès before its acquisition by Carrefour – entrusted the company that I co-created with the development of OOSHOP, the first major food (including fresh food) and beverage e-commerce site in France. The creation covered not only the e-commerce site but also back-office applications. An extraordinary adventure that resulted in some great memories, the greatest being Carrefour’s debut as the first major global retailer to launch an e-commerce initiative. Shortly thereafter, starting from the same base, followed the sites of Picard (then owned by Carrefour), Carrefour Wines, Carrefour Beauty, and many more. 20 years later, Carrefour now combines 8 sites, including OOSHOP, into a single site: Carrefour. Carrefour is looking to invest nearly 3 billion euros of its spend to transform 50% of its stores into Click & Collect centers and open up some 170 “drive” in-store collection sites. By 2022, 50% of its investments will be placed in digital. This is all taking place in an atmosphere that is ever changing. Recently, Kantar Worldpanel announced that Amazon now represents 20% of French e-commerce, a number that rises to 44% in the United States. The steamroller is moving, and it seems nothing will stop it; in traditional retail and, in the near future, for retail banking as well. From the takeover of Whole Foods Market by Amazon-to the disappearance of retail giants like Toys ‘R’ Us, show not only the quickening rate of change but also remind us that no one is safe anymore. So what happened in 20 years that led to such a sudden change? Or rather, what did not happen? It is easy to lecture on and to simply blame retail giants for the ever-static status quo. Too easy. It is also easy to forget that large retailers have spent these years of transformation trying to change an infrastructure that has been unchanged so long, which considerably complicates their strategies. Retail often has mixed reviews when it comes to the opinion of the general public. Yet when you’ve rubbed shoulders with people who work on in retail on a daily basis, this image is different. It’s a difficult job, but people are passionate about their stores and their teams. They understand their customers, and what it takes to connect with them. It’s also a universe that works largely on meritocracy. If you haven’t unpacked pallets (just as everyone else once had to), managed shelves, or worked the graveyard shift, you haven’t yet earned your place at the table. Even when it comes to the highest levels of the organization, at least until recently, you will often find a veteran employee, who started from the bottom and worked way up. It’s the opinion of those employees that your consumers trust. It’s their word that holds weight. The stage is set. Large retailers have lived these last twenty years full of fear that e-commerce will push them from the branch on which they are sitting. Fearful that their customers will switch to online purchasing only. Fearful that stores will be turned into nothing but showrooms, where understand: people come to look in store but purchase online. It’s understandable that stores are fearful. But in avoiding the problem and trying to find an impossible consensus on how to mitigate the sway of change in a complex market ecosystem, stores are missing the mark. Someone has already begun to capitalize on those earlier fears. And we knew it was coming. Things couldn’t just stay the same. The branch was bound to break with the weight of pressure that digital was placing on it. Today online initiatives are springing up across retail. Companies that have often preached caution are now announcing massive investments in digital and online. Perhaps it’s a Toys “R” Us effect… after all, no one wants to disappear. But the logistics of digital have changed, and the mastery of data and communication that Amazon has acquired over a time when GDPR and many other privacy protections didn’t exist is now that much more complex and difficult to cultivate. These new investments are necessary, but it’s worth remembering that to succeed you need to invest in your strengths. I am and will remain, convinced that the greatest strength of large retailers is their employees. Hundreds of thousands, if not millions, of people, spread across the field. People who are passionate about their job, their department, and who often have cultivated a rapport with customers. Remember, stores also play a fundamental social role. People who come to buy a pair of running shoes at a local sports store come for the advice of passionate sellers, who themselves may have been athletes who know the sport as well as the product. With these conditions, it is hard to believe that small retailers and shops can survive when after 10 minutes of research, you conclude that there is no seller near you, or no incentive to head to the store. What’s the point? Why not buy online then? To succeed, it is imperative that employees step outside the physical store for their job and enter the digital world. Retailers are often present on national and international social networks but tend to struggle with local social media. 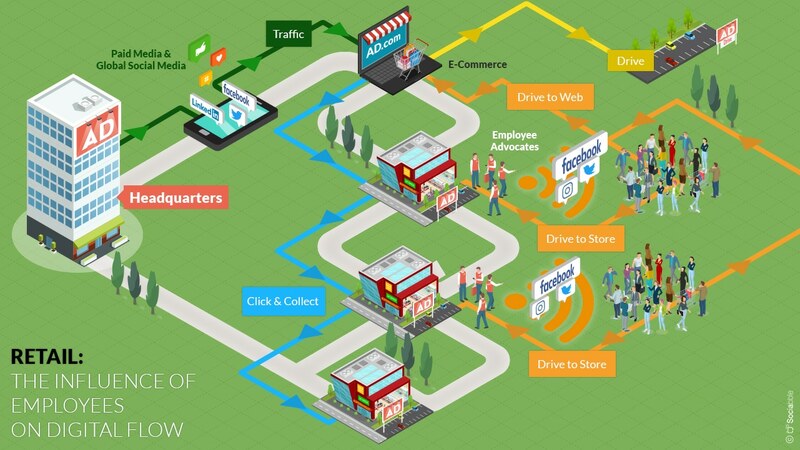 Local store sellers have the potential to run “the extra mile” of retails digital strategy. It’s as simple as tapping into their already established network of friends and contacts; Enter Employee Advocacy. 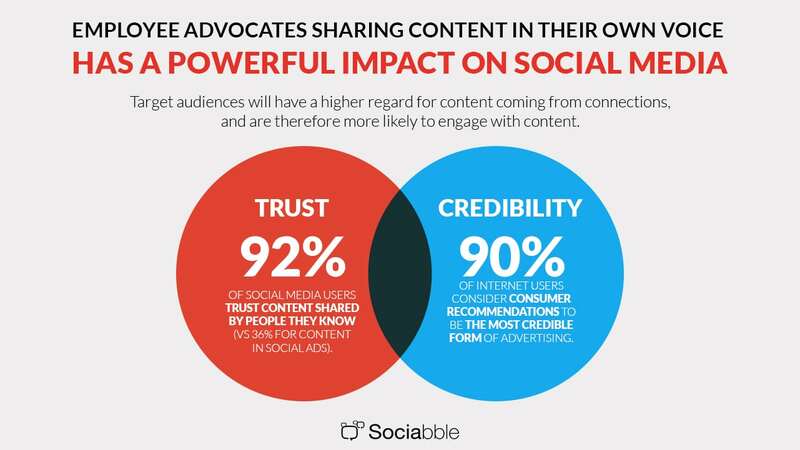 Employee Advocacy works off a simple principle: Your employees hold more trust and sway over your consumers than brand messages alone. The math is simple – 100,000 people, each with a personal network of 200 friends, equals a potential 20 million people who can be reached much more efficiently than with branded content, which is known to have a diminishing organic reach. 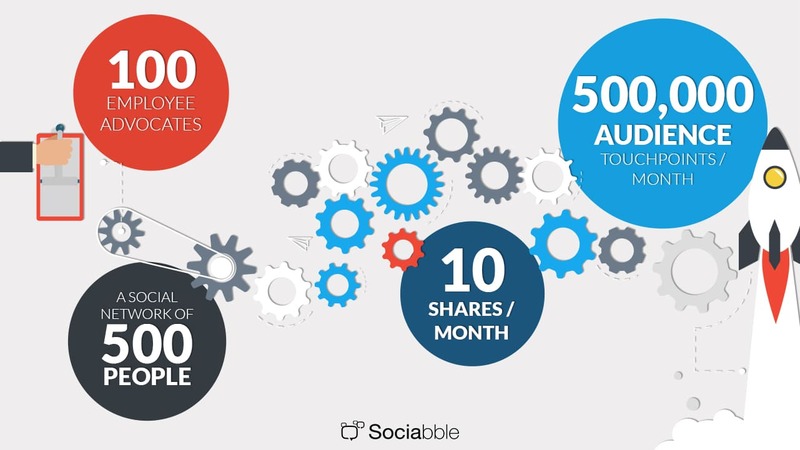 This is how employee advocacy works. You tap into the greatest resource you already have- your employees. Who better than to represent your brand than the people who know and understand your values, goals, and potential. Now is the time…but where do you start? In the United States in particular, and now in Europe, we are seeing more and more digital initiatives emerge. The urgency is felt, and the “We will see” has now become “We MUST do this”. Now is the time to invest in initiatives such as Employee Advocacy. Having worked with retail I’m excited to be able to work in this industry again, this time from the perspective of the employees. It’s exciting, and it’s inspiring to see people – who often have only their personal smartphone and not even a professional email address – enter the battle to defend their profession, their work, and their store. So where do you start? Employee Advocacy is not simply asking people to turn into a digital advertising sign. It is about offering relevant, interesting content to share and helping them become an active participant in sharing, engaging with, and creating this content. Whether this is on their personal account or on the store’s local Facebook page, it is the same principle. Help them inform – via photos, videos, and text – their online networks about the life of the store, new arrivals, company news, team successes, store events, the latest sponsorship project, etc. Help them show the soul of your company. Create a connection with them, as well as between them and their community. Demonstrate that the dehumanization of digital does not always prevail. Doing this will help structure and organize massive local communication in a more authentic setting. More than just connecting with your employees, your initiative must also include a way to incentivize your employees and collaborators. Today’s technology allows retailers to track and attribute the origin of a sale that is made on an e-commerce site to the person who originally shared the article or information (that brought in the sale) on social networks. It can also measure “drive to store” programs by tracking the number of people who came into the store thanks to sharing on social networks. Acknowledging your employee ambassadors and social sellers who made the effort and who, by their individual actions, have brought people into the store or contributed to online sales is paramount. Finally, in addition to digitizing your teams, also digitize your store. I mean with more than just “Click & Collect”. Every week I wait 15 minutes in line at the supermarket checkout, because I enjoy choosing my groceries in person. But I am cut off from the world outside the store. No 3G, and no wi-fi. Why not open wifi within your store? Give access to the deals and store offers, redirect after a wifi sign-in to a page that promotes your team, store offers, and upcoming events, etc… as most airports do. This is but one example among a hundred which demonstrate the colossal potential the digital within the store. For retailers, it is no longer a question of simply mimicking Amazon. It’s too late for that. You need to change the value proposition, the customer approach, and ask the question: “Can Amazon do it today?” or “Is Amazon doing it today?” If the answer is no, then investigate. Step outside the comfort zone and tap into the potential at your fingertips. Multichannel marketing is only one factor in a complex equation. Employees, stores, and creating a relationship with the local community, these are the underused heroes of digital transformation within retail. They are an undeniable, authentic, and underused asset. Now is your moment. It is time to act.